Sundown Trail has a guest blogger today – my daughter, Marti Ryan. She is a musician and video blogger in Nashville, TN. I have always loved my Dad’s stories of when he was young. He grew up in a time that I can’t imagine – one room schoolhouses, riding horses, heading off into the woods with his dog to hunt furry woodland creatures . . . those days are long gone, but live on in stories and pictures. I’ve encouraged Dad to write a blog for years, and was tickled pink when he decided to start writing Sundown Trail. He has a collection of short stories called Tales from Clear Creek that will be available as an e-book soon, and he’s currently working on his first western novel. But I didn’t come over here to write a guest blog to brag on my Dad (although I could spend an entire page doing just that). I thought it would be fun to write a blog about one of MY childhood memories. As you can probably tell from the title – it’s about a snowman. Winter is drawing to a close, and as usual, Mother Nature is keeping us on our toes. She’s been teasing us with beautiful sunny warm weather, and then promptly throwing snow and cold back in our faces to remind us that’s she’s not quite finished with winter yet. I live in Tennessee, and bless their hearts, Tennesseans FREAK OUT when they see a snowflake. Missourians just slow down and plow ahead with their lives, but everything screeches to a halt here in Nashville at the MENTION of snow. Everyone cancels everything, and races to the store to buy milk, bread, and eggs. It’s become a local joke to post pictures on Facebook of empty shelves in the grocery stores when snow is forecasted. Snow doesn’t last long here, so when we get any kind of accumulation, children rush outside for a few hours in a few inches of snow to have snowball fights, sort-of-kind-of sled, and build itty-bitty snowmen. Last week I opened my back door to an accumulation of snow, and briefly thought of building one of these itty-bitty snowmen as a tribute to the end of winter. After drying off my snowy, muddy doggies, I instead chose to make a hot cup of tea and remember a Missouri winter long ago when I built my very first snowman . . . . I don’t remember if it was my idea, or Mom’s idea, but I remember being super-excited as I bounded into the front yard to play in the snow with Mom. My parents and I lived in a little yellow house on a little street in a little town in Southeast Missouri. The front yard was covered in a thick blanket of fresh snow, and I tramped around in the sparkling stuff, fascinated that it was sticking to my boots, and comparing my small bootprints to Mom’s big ones. She showed me that the snow not only stuck to my boots, but it stuck to itself, and I watched in amazement as she rolled a small snowball around the yard and made a large snowball. We repeated this action two more times, and soon had a stereotypical snowman ready for personalizing. Our little yellow house was heated with a wood stove in the basement, and Mom took pieces of bark from the woodpile and made eyes and a smiling mouth for the snowman. The bark mouth kinda looked like he had teeth, which gave him a whimsical look. She then completed his face with the traditional carrot nose. I remember really really wanting a top hat like I’d seen on the Frosty the Snowman cartoon, but we didn’t have one. Instead, Mom placed one of Dad’s hunting caps on his snowy bald head. I was too little to reach the snowman’s face to help with the personalization, but not to be left out, I took little pieces of bark and made buttons down his front. Mom completed his look with a piece of pink plaid fabric for a scarf. He was perfect. Or at least, in a little girl’s eyes he was perfect. 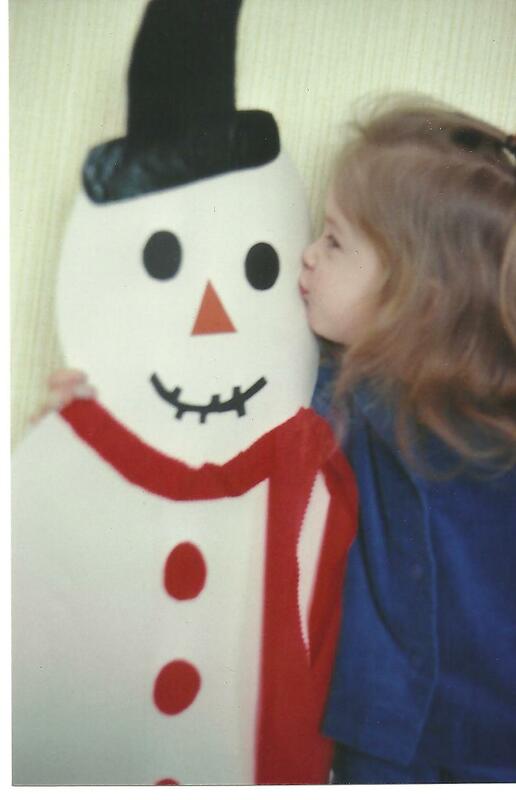 My very first snowman. I was thrilled. Dad was impressed when he came home from work, and happy to sacrifice his hunting cap for a short while. My snowman was right by the living room window, so I spent the rest of the evening beaming at him from inside the warmth of the little yellow house. I went to bed that night and dreamed happy snowy little girl dreams. The next morning, I bounced out of bed and raced to the living room. Mom was working on something on the dining room table, but I barely noticed her as I raced to the window . . . . . . and noticed the curtains were closed. This was odd. Even as a little girl, I was attune to the circadian rhythm of the household, and the living room curtains were always closed at night, and opened first thing in the morning. Yet there they were. Closed. Not to be deterred, I threw open the curtains to greet my snowman. . . and the front yard was empty. The snowman melted overnight. That would have been the logical explanation. However, that would also have been a really boring story. And I don’t do boring. 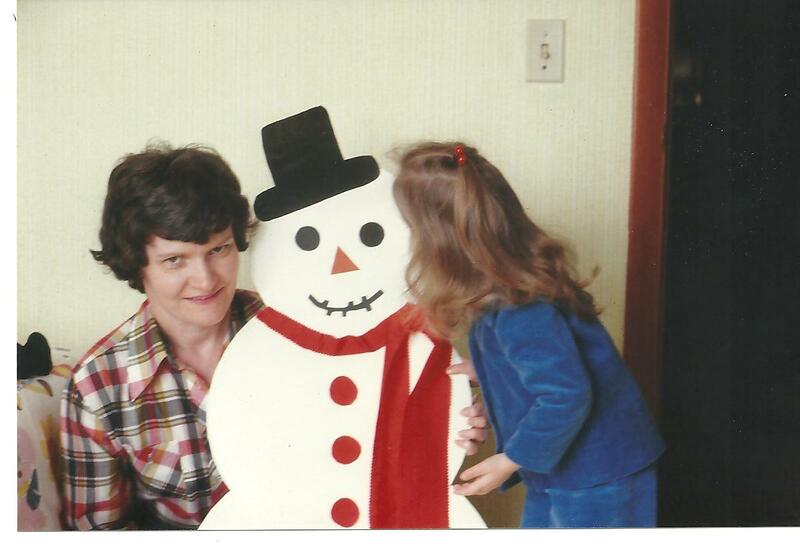 With glistening, wide eyes, I whirled around to Mom and opened my mouth to ask where my snowman was. No words could come out. I was so shocked he had vanished. Mom was coming around the side of the dining room table with her arms outstretched to administer comfort and an explanation. I sat in a miserable heap in her lap as she told me what happened. It had gotten bitterly cold overnight, and everything froze solid. Including my snowman. There was a basketball game in town that night, and so all the high school kids were cruising around town afterwards. Mom and Dad woke up in the middle of the night when they heard noises in the front yard. They went to the window just in time to see some teenage boys load my entire frozen-solid snowman in the back of a pickup truck and drive away. Mom gathered up the tearful little girl piled in her lap and carried me over to the dining room table. She was making me a brand new snowman. 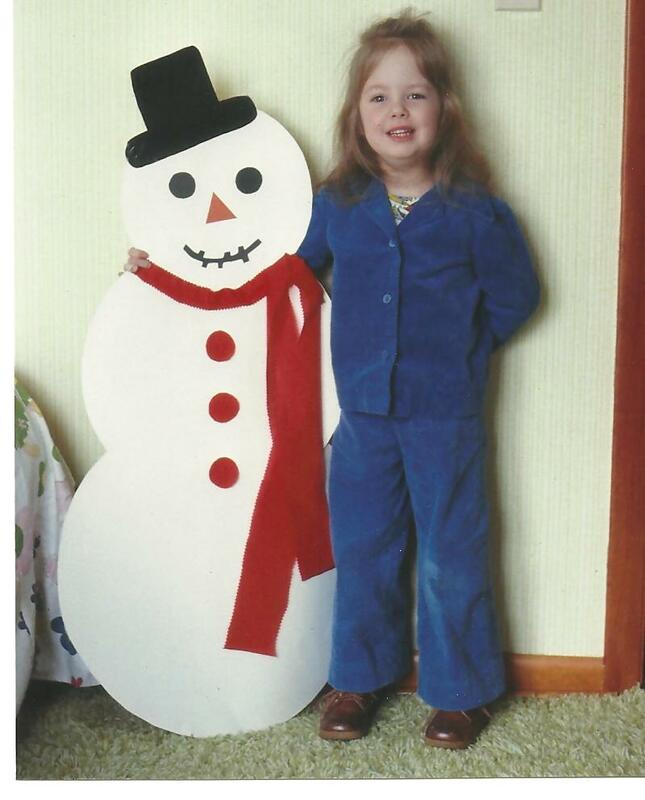 There was not enough snow to make another snowman outside, so she created me one out of posterboard and construction paper. And this one had a top hat! Also, buttons and teeth. He was a very cool snowman. Later in the week, we heard that several people had seen a snowman with teeth in the back of a pickup truck cruising around town. Looking back, I’m pleased to know he had quite an adventure before he reached the fate of every snowman when winter ends. And I’m happy that the boys had so much fun cruising around with my snowman. A friend of my mother’s who wrote poetry immortalized my snowman in verse, and titled the poem “The Runaway Snowman.” There’s a book published somewhere with my snowman’s poem in it. I learned very early the “make lemonade out of lemons” lesson as I played with my posterboard snowman well into the summer. There were other winters, and other snowmen, but my first one – my perfect snowman that I had for less than 24 hours – I will always remember. I hear that seven inches of snow was dumped on Missouri today. I imagine there are hundreds of snowmen in hundreds of yards across the Show-Me-State tonight, happily smiling frozen smiles throughout the night and ready to be greeted in the morning, while little boys and girls are dreaming happy snowy little boy and girl dreams. A very sweet story Marti. Are you as pretty now as you were in the snowman pictures?